Gelato means “ice cream” in Italian but there is a key difference. While both versions build from a frozen custard base, it’s the way the custard is made that sets the two apart. Which is better? Here are some very good reasons why you should consider eating gelato over ice cream. When making the custard base, gelato uses more milk than cream, which makes it much lower in fat and calories. It’s much better for your waistline! Ice cream has up to 30% fat content but with gelato, the number is much less (up to 10%). If low fat or fat free milk is used, the percentage of fat will be even lower. This is one of the major reasons why gelato has about half the calories of ice cream, too. Another key difference between the two is that gelato rarely uses the egg yolks, only the egg whites. Have you noticed that the texture between ice cream and gelato is much different? Gelato is much smoother and creamier than ice cream because ice cream’s fat content makes it more solid. This gives it the impression that gelato is much more decadent than its fat and calorie count would suggest. Gelato is a gluten free dessert. Some ice cream is also gluten free, but you need to make sure you check the packaging to be safe. 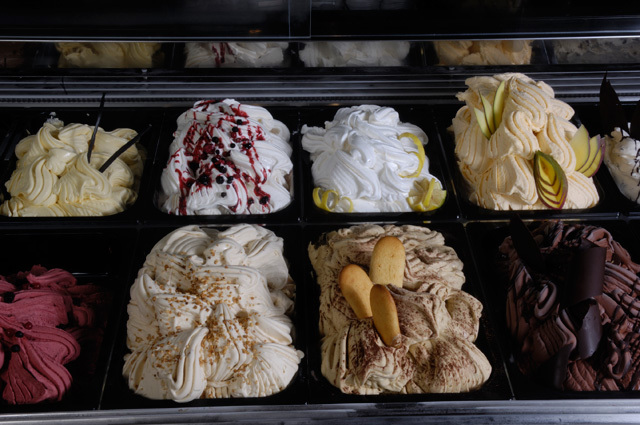 The standard ingredients in gelato are milk, cream, sugar, and egg whites. The only real danger for those who need to eat a gluten free diet is in the mix-ins. For instance, brownies and cookie dough aren’t typically gluten free (but they could be). However, at its simplest, gelato doesn’t contain gluten. Because gelato is lower in fat than ice cream, the resulting flavors are a lot more intense. Since butterfat tends to coat your taste buds, this can affect how your nerves interpret the flavors. The end result is that you need to use a higher percentage of flavors and additives in order to make a tasty product. Since gelato is naturally low fat, the flavors are more intense. For example, less chocolate needs to be used in gelato for the taste receptors to register an intense chocolate flavor. This also contributes to gelato having lower calories. Since gelato originates in Italy, it’s hard not to feel slightly glamorous while eating it. In the movie Roman Holiday, Audrey Hepburn’s character enjoyed her first gelato cone. Gelato was also eaten in Under the Tuscan Sun and Eat, Pray, Love, both of which were filmed in Italy. Based on its reputation, how can you not feel like a movie star when you eat it? Even though both treats are very similar, gelato has some benefits over ice cream. If you haven’t made the switch to gelato yet, it’s at least worth considering!